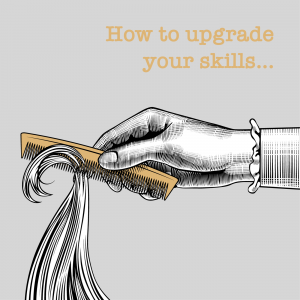 You’ve completed your training and/or apprenticeship and set yourself up as a working hairstylist. Why bother with continuing education? Why not just hit cruise control and rely on the skills you already have? Well, we’re here to tell you about 3 big payoffs to upgrading your skills — payoffs that go way beyond learning new techniques. Let’s look at how each of these works, and how they reinforce each other. One stylist we know told us she found doing Balayage to be nerve-racking and not very satisfying. “It’s just not my thing,” she said. “I’ll leave it to the other stylists in my salon.” And leave them with the higher earnings that come with this advanced process. But then a Balayage class was offered in her salon and she took it. And guess what happened? The next time a client requested this technique, she experienced a triple win: not only was she less stressed so she could enjoy the process, her client was thrilled with the results, and she made more money doing a high-end chemical service. It’s hard to be fully present with a client when you’re stressing over using an advanced technique or a new colour line. And it’s easy to decide you don’t like it when you feel unsure of what you’re doing. But here’s the thing: nobody knows what they’re doing when they first try something new. When you get solid instruction in a new skill, either in person or online, your mental state changes. You’re now less distracted by that inner critic whispering that you don’t really know what you’re doing, other stylists are doing it better, and so on. The more you learn, the more your competence grows. By spending time with experts in person or online, you hone your chops, and that makes you feel more confident about what you’re offering clients. Now you can put your new knowledge into action without worrying about whether you’re doing it right. You’re more relaxed so you can focus on your clients instead of your anxiety. Clients sense your greater confidence. This has a snowball effect. They recommend you more, and more new clients come your way. And here’s the icing on the cake: the more confidence you gain, the more you relax and have fun doing what you do every day! You’re working in an industry that’s constantly moving. Fashions change quickly. Don’t get left behind. By staying up to date on new styles, products, equipment, and techniques, you can expand your range of clients. Not only can you attract clients looking for the latest trends, you’ll also boost your value with more conservative clients. They’ll sense your greater expertise and relevance, and might trust you with giving their classic look a more contemporary vibe. When you keep your technical skills current, your clients learn to rely on you for new ideas and inspiration. Your status as style expert grows. You can truly serve your clients, connecting them with what’s happening today and how current trends might be relevant to them. There are the two broad areas where continuing education helps you increase your income: product sales and valuing your services. Your clients want reliable information about hair care. Learning more about your product lines means you can pass that information along. By taking advantage of product education, you become their go-to hair-care expert. Clients are grateful that you’ve simplified their grooming routine and you’re earning more money in sales. Win-win. Increasing your value — When you expand your skills through education, your services become more valuable. This gives you more confidence in what you offer and makes it easier for you to rationalize price increases. 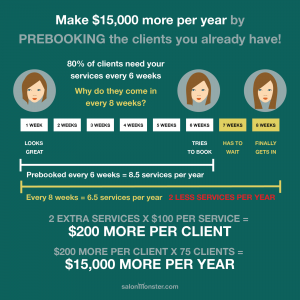 And the more you increase your prices, the more valuable your services appear! Win-win, and win. In part 2 of this article, we’ll explore the continuing education options for both salon owners and independent stylists.